Ben Sanders is a New Zealander but you would not know it from his all American gun-fest that is the Marshall Grade series. These books steeped in the American super hard-boiled tradition, usually anchored by a violently proficient loner, popularised by authors like Lee Child. Marshall’s Law opens months after the events in American Blood. 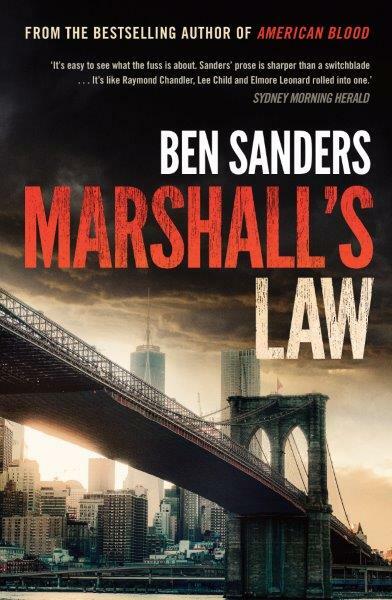 There is still a contract out on Marshall, Sander’s Jack Reacher style loner and former cop who went into witness protection after an undercover operation gone wrong. Unable to find him, they go after his US Marshal contact Lucas Cohen in Santa Fe. Cohen survives a kidnapping attempt and alerts Marshall who then leaves his hiding spot in LA to travel to the East Coast to try and get some information. For no real reason, Cohen also heads to New York with a view to helping Marshall out. Meanwhile, a violent crime boss called Dexter Vine is looking to capture or kill Marshall for the bounty which he needs to pay off debts to a bigger crime boss. Much of the narrative focusses on the cat and mouse games between Vine’s goons and Marshall with Cohen providing some related back-up as he puts things together. The interest here is when trap around Marshall gets tighter, and his ability to deal with whatever is thrown at him is constantly put to the test in inventive ways. Plenty of people get killed, some apparently ‘deserve it’ but plenty of innocent bystanders get caught in the crossfire. And it all builds effectively to a bloody, desperate conclusion which at least manages to tie up a bunch of loose ends from American Blood. This book will appeal to those who like this particular style of narrative. Hard boiled almost beyond recognition, no sense of humour, no sense of irony, and a focus, predominantly on hard men saying little, doing violent things and often meeting violent ends. There is little to distinguish Marshall from Cohen, Vine or Vine’s henchmen Ludo, Tol and Perry except in their proficiency with weapons and their level of compassion for others. On the proficiency front Marshall clearly comes out on top with Perry somewhere near the bottom. It is Perry’s tiny nub of compassion that keeps getting him in trouble while Marshall and Cohen seem to feel vaguely for their fellow humans. There are no twists or surprises in Marshall’s Law or even any real shades of grey. The good guys are good and the bad guys are bad, but they are all violent, particularly towards each other. Sanders shows a keen ability to capture the American vernacular, speech patterns and settings and proves he is able to play in the same weapon-filled sandpit as some of his more famous American counterparts.